Recently, I wrote a blog post on choosing the right Key Performance Indicators (KPIs) for your business, which went back to the basics of performance measurement. This made me want to go back to the roots of what we at Target Dashboard are about: creating dashboards that tell managers important information about their KPI data. 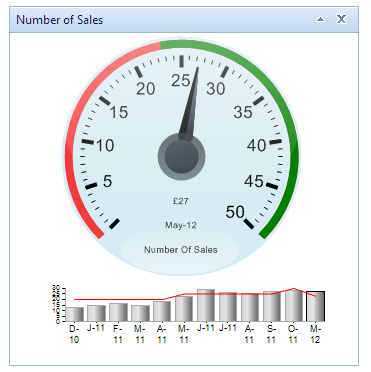 KPI Dashboards can be tricky to create even if you have KPI data. With that in mind, I have written this guide to show you how to create meaningful, effective KPI Dashboards from scratch. To do this, I will break this down into 8 easy steps. In order to create an effective dashboard, you must first consider the KPIs you wish to measure. Though the process for choosing your KPIs has been documented in articles longer than this entire guide, here are two simple things you should remember when choosing your KPIs. i. Your KPIs should always tell you something about the progress of your company. A mistake that many people make is that they assume KPIs are simply any measurable metric. However, while KPIs are indeed metrics, they are the metrics which can tell you how your company is fairing in a certain area of business. If you’re evaluating your KPIs and don’t know where to start, just ask yourself: Can this KPI tell me if my company is doing good, ok, or bad? Even if you’ve established that your KPI can gauge company progress, it doesn’t really have much use if you can’t do anything about it. A good example of this is measuring something like total sales every month. While this may seem as if it’s indicative of business performance, take another look at the chart above. This metric will almost always increase (unless many customers leave a business) and therefore won’t tell you that action is required until it is too late. A metric such as new sales every month tells managers if action needs to be taken much earlier, and therefore is more indicative of business progress. iii. Your KPIs must have dates associated with them (mostly). KPIs are designed to show the progress of your business, and allow you to spot trends in your data. By definition, this means that your data has to have the ability to be compared to previous values, and therefore occur at regular intervals (days, weeks, months, years). After all, how can you take action if you don’t know when your KPI values occurred? Learn how easy it is to create KPI dashboards to visualise your data using Target Dashboard and start gaining a competitive advantage. In my experience working with companies around the world, one of the first hurdles that businesses come across when creating dashboards is that their data isn’t in the format required by their dashboard software (unless they’re using Excel, which is useful). While this is very subjective, I urge you to find out as soon as possible what the requirements are for your chosen software; trust me, it’ll save you much heartache. While many different dashboard services may require different table formats, let me detail the correct format for our software, Target Dashboard, which has a very intuitive, logical format that really only requires two steps to modify. To recap a point made in from the previous section, creating dashboards is usually most effective for spotting trends in data measured at regular intervals. With this in mind, Target Dashboard is designed to hold time based data, and therefore requires you to arrange your data with the dates in a column, as below. Some might initially choose to place their dates as table headings. For Target Dashboard specifically, this is not compatible. Therefore, by arranging your data according to date beforehand, you can import your data far more easily. ii. Decide whether you wish to have category columns. Depending on the KPIs you are measuring, you may wish to further group your data according to category (such as product, or perhaps region). The main advantage to this is that you can pivot your data later, which will allow you to compare two categories on the same chart. Other than these two points, you’re pretty much good to go. Other dashboard software applications will have their own preferred layouts, so make sure you learn about them before importing your data into them! So, you’ve got the right data in the right configuration. Congrats! Now, the real fun begins. Creating a dashboard can seem like a daunting process, with so many questions that need answering. The best way to start anything is from the beginning, and for dashboards, that involves deciding on the layout which your dashboard will take. The first thing to learn about the layout of your dashboard is that it is likely to change as you go through the subsequent steps in this guide. Your Dashboard layout is an ongoing process which requires careful consideration. Don’t be afraid to experiment the layout, and remember these rules of thumb. Who is going to use your dashboard? Is it your manager, or perhaps you are designing a dashboard for your stakeholders. Taking the end user into consideration (if it isn’t yourself) can mean the difference between them understanding your message, or missing the point. If you are using a dashboard application which allows a grid-style layout, the size of grid will depend on the number of KPIs you wish to show, as well as if you wish to present your dashboard externally (warranting larger charts). For example, if you were creating a dashboard for internal use, you might fit a lot more information onto it, then if it were used for a presentation, which would be better displayed so that the dashboard doesn’t have to be scrolled to view all the info. ii. Design your layout around your chart choices. Usually, the charts which you wish to show on your dashboard will influence your layout the most. Why? Because emphasising your most important information is usually the goal of any KPI dashboard builder. However, since some information will tend to take precedence over others, it needs to be emphasised in a way which prevents the rest from being ignored. 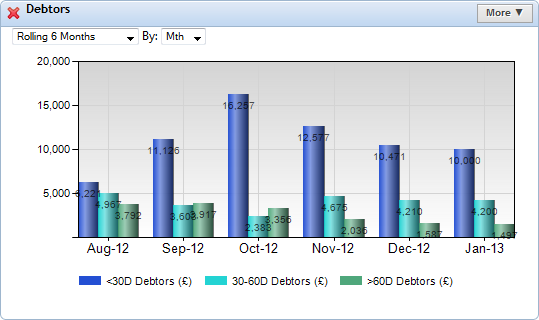 Here is a KPI dashboard with an assortment of charts. While this shows all the information required, it doesn’t draw the user’s eye to anything in particular. Here’s the same dashboard rearranged. 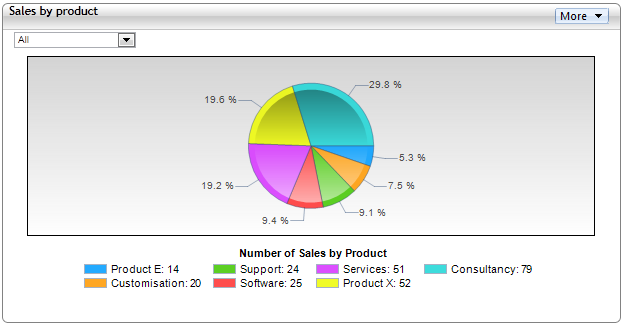 Now, the categorical Pie-chart is centred, which acts as a point of reference for the other charts in this dashboard. Remember, you may have the most beautiful, meaningful charts in your dashboard, but laying them out the wrong way can take away some of their impact. In the last step, we chose a rudimentary layout for our dashboard. In this step, we’re going to fill that dashboard with your KPIs. While this is probably the most important part of dashboard creation, choosing the best charts for your dashboard is not as complex as it may seem. While choosing charts can be broken down into many steps, here are the main three which are all you need to know. Thinking back to choosing the right KPIs, your KPIs should always show important information about your company which you can take action on. But, even if you know the message your KPIs are showing, you still have to communicate that message to other users of your dashboard. Your charts therefore have to show this message in the clearest way possible. The message which your KPIs are communicating will often be quite a simple, yet important one. 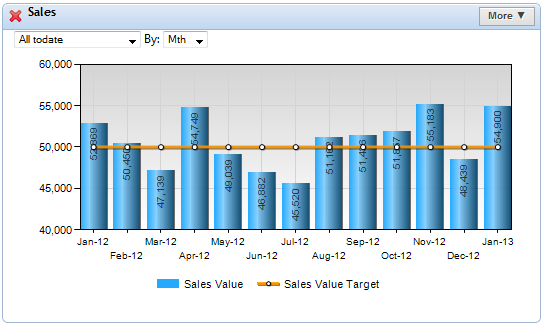 Different KPIs have different functions, and each has charts which are best used to show them. In my experience, Charts for KPIs can be divided into four broad categories. Quantitative KPIs focus on communicating the value of your KPIs to users. Sales KPIs often have a quantitative element to them, as managers often need to know the exact number associated with the KPI in order to make informed business decisions. To communicate quantitative KPIs most effectively, an example of an effective chart to use is the Column chart, as it allows the user to see values easily, while still offering understandable trend information, making them a powerful chart choice. 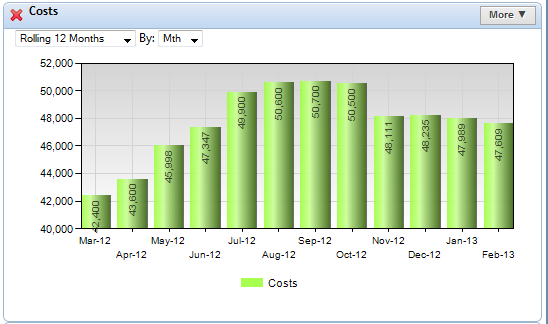 You may also consider using stacked column charts to show how quantitative KPIs are broken down. Directional KPIs focus on showing the variation in the individual measurements of data, and whether there is a trend or pattern to these measurements. Measuring directional KPIs is often the quickest way of telling if an area of your business is doing well, or if it needs improvement. Because directional KPis focus on trend information, many of your charts will show directional information to some extent. For this, I recommend Area Charts as a starting point for showing trends. Unlike line charts (which are pretty much the same chart without the filled colour below the trend line), area charts make it very easy for users to see the line of progess, as there is a clear contrast between the filled chart and the unused space in the chart grid. 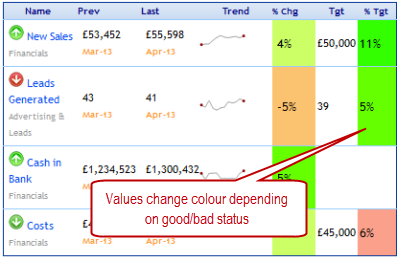 These KPIs are often associated with Target Values, or values which you don’t want them to fall under (e.g. 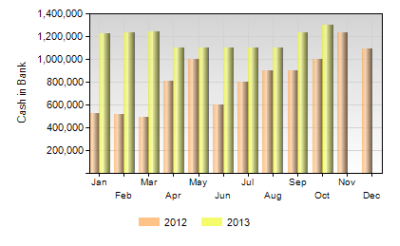 sales per month) or go over (e.g. budget), as well as actions associated with any change in their values. You can also represent this with a gauge, which assigns a colour depending on if you met your target or not. Depending on the status of the gauge (green or red), you might choose to take action to capitalise or improve on your current statistic. Unlike the other types of KPIs which are based in time, categorical KPIs (or distribution KPIs) are based on information that is segmented into many different categories. These can be useful when compared, as changes in distribution could indicate market shifts, for instance. While I find that time-based charts are more powerful decision-making tools, there will be times that showing categorical KPI data is needed. 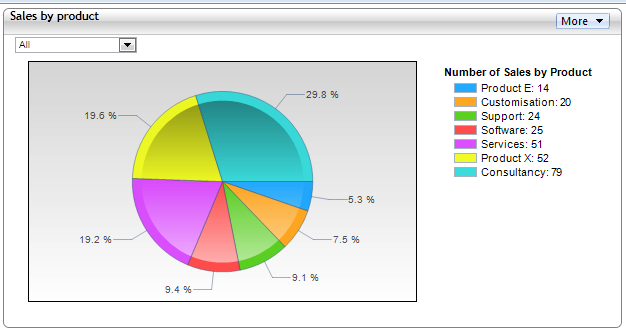 Categorical KPIs can be shown in many ways, with the most common being the Pie Chart. The following chart shows the total number of products sold by a company, broken down into the different product types. 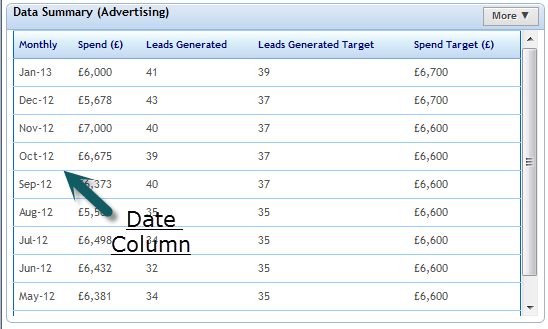 I’ve just listed the four main KPI types, along with some examples for charting them correctly. However, there are many more types to choose from, which you can find through experimentation. 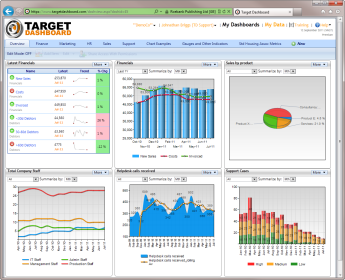 Also, dashboard software doesn’t just contain charts for showing your KPIs. 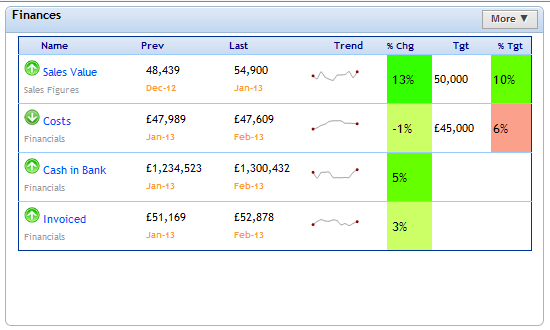 Additional dashboard items can also add clarity, as well as variation to your displayed KPIs. Here are three which can provide additional information and unique insights into your KPIs. 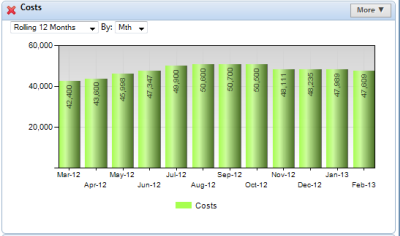 Unlike regular charts, these charts are optimised for comparing data taken from the same timeframe in different years. This can be used just to compare data from similar timeframes, or to observe trends for different years side by side. 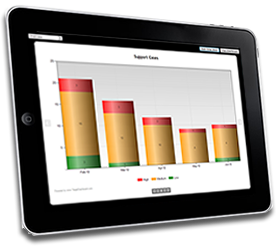 Score cards are useful for showing information on multiple KPIs at a glance. 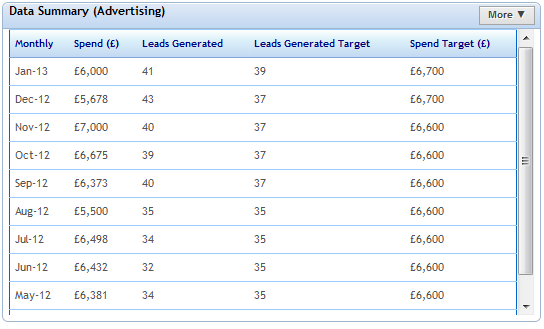 It’s also a great way of directly comparing KPIs that aren’t contained in the same data table. However, you must be careful when selecting the data to put into a scorecard, as inserting unrelated KPIs can create the wrong message for your audience. While charts and other ways of visualising data are great to communicate your message, some people might prefer to see the numbers instead. Therefore, including a summary of the raw data in your table might allow you to get your point across for people with different viewing preferences. Know your message, and finding the right chart becomes easy! While choosing the correct charts for your dashboard can be broken down into many stages of decision making, I think that there is only one real thing that you have to decide on: the message which you want to communicate to others. If you can understand the nature of your KPIs and the important information about your company which they contain, choosing the right chart to show that information can be quite easy. 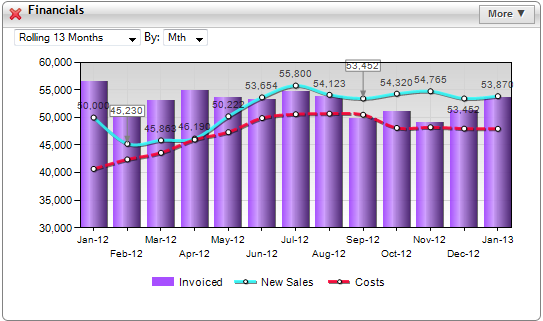 In the previous chapter, we added charts to our dashboards which show users the key information in our KPIs. Now, let’s make that information more obvious and easier to understand. A KPI dashboard can contain very useful information, but still be useless if no-one can understand it. 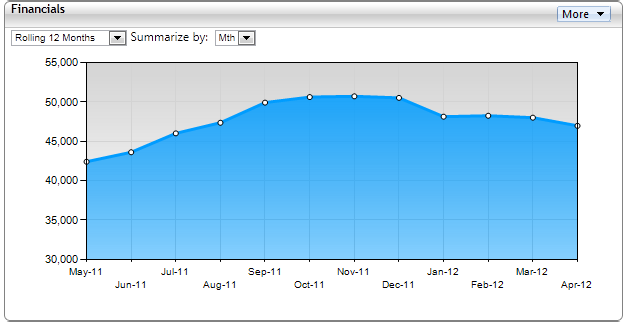 By correctly annotating and modifying your charts, your users can spot trends and take action more quickly and easily. Here are a few tips to make your KPIs more understandable. 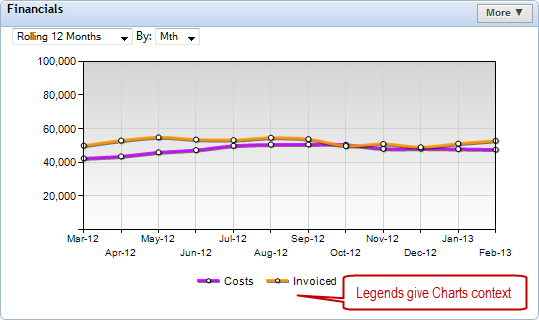 For charts which display multiple KPIs, legends must be included in order to tell which information belongs to which KPI. Legends reduce the space for a chart to be displayed in the dashboard. Another option is to position your legends inside your chart to save space. Sometimes, you will have KPI data that has only small differences between time intervals, like the chart below. From a column chart like this, it can be hard to follow trends at a glance. 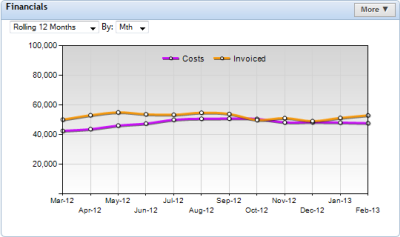 To make your KPIs more understandable, what you can do is change the minimum value on the Y-axis of your chart. In the example below, I’ve changed the lowest value of the Y-axis to be 40,000. See how the trend information is easier to see now? Since none of the values in the chart are below 40,000, we don’t lose any information. Of course, remember that if you intend to show value information, then this may not be the best idea. iii. Use colours as status indicators. If you are using chart items such as gauges and scorecards, you’ll know how effective colours can be at making your KPI information easier to understand. You can also change colours to emphasise data in other chart types. 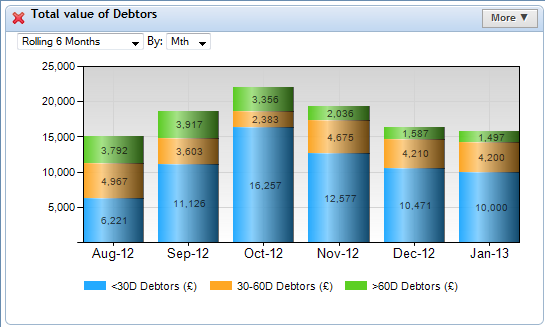 For example, if we take this column chart with three KPIs, the similar colours make us see each KPI as part of a whole. If we change one column to red, we see it as different, and start comparing that column to the others, which is what we want. In part one, we decided on a skeleton layout for our KPI dashboard. Now that we have charts in our dashboard, we should revisit our chart layout, and tweak it to make sure our information is seen the way we want it to be seen. Here are some tips which you can use to improve your dashboard layout to emphasise your important information. i. 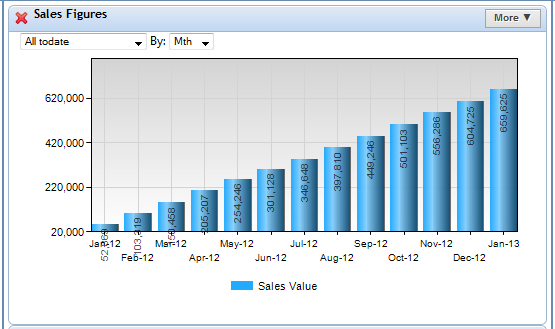 Consider Multiple charts for comparing KPIs. If too much information is placed into one chart (as I often see with line and column charts), the most important information you want people to see is often muddled, and sometimes lost. If you’ve also had this problem, consider splitting up this information into multiple charts. Then, lay out these charts next to each other in your dashboard. 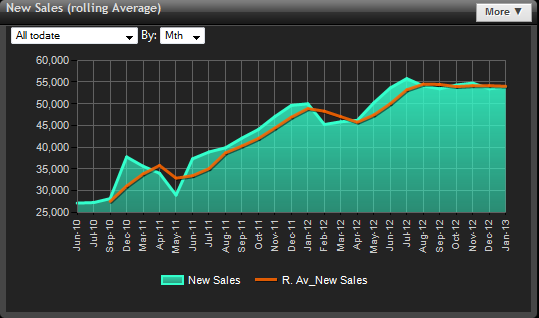 Doing this still lets you compare your KPIs, and allows you to easily see extra information on each chart. Also, the extra space lets you annotate your charts more effectively, which makes your KPIs more understandable. ii. 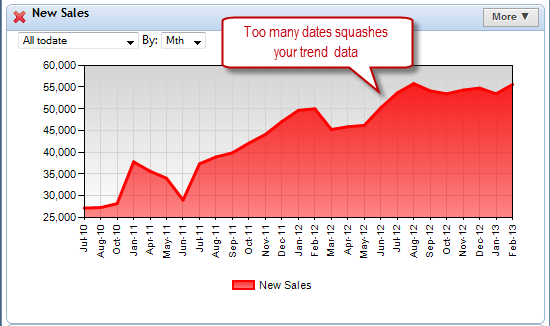 Change your chart sizes to match your data. While filling one chart with too much information is usually a bad idea, this doesn’t just mean too many KPIs. Sometimes, too much time-based information is included, which can make your charts less readable. In this chart, we have too much time-based information in a small space. This makes the trend information cramped. But, we can make this information readable by increasing the length of the chart. Remember, if your dashboard is going to be used by others, then it must be able to be understood at a glance. Revising your dashboard layout until it is perfect is an important step in creating effective KPI dashboards. 8. Present your dashboards in the way your users want! It’s been a long journey, and we’re almost done! Throughout this post, I have drilled into you the importance of dashboards being understandable. This is the most important quality for a dashboard, except the relevance of your data. By presenting your dashboard the best way possible, you ensure your audience gets what you’re trying to say. A great speech will only have an impact when presented by a great speaker! Here are a few ways to present your dashboards to have the greatest impact. Sometimes, nothing can beat a management report, not even a presentation. Having a management report with your dashboard information allows people to review your information at their own pace, and make notes on it for later discussion. 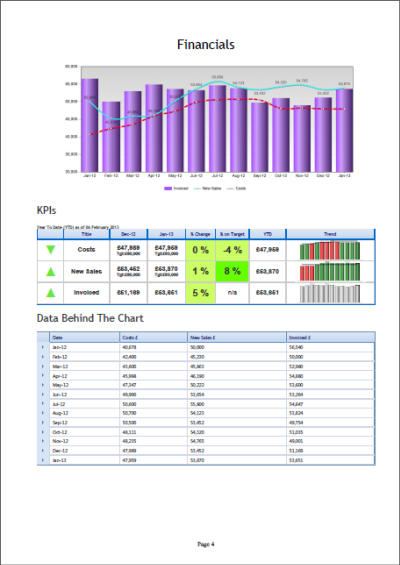 In this report, dashboard charts are supplemented with scorecards showing target information, as well as the original table information for context. A tool like this allows users to analyse their data and make the best decisions. Phones Tablet computers such as the iPad are fast becoming common business platforms. This has meant a rise in people needing their KPI info at their fingertips at anytime and anyplace. Displaying your dashboards on a phone or tablet requires a little thought. Firstly, your dashboard software must be optimised for a small screen. What you can also do is invert the colour display on your dashboards. The black background works very well on tablets, adding a modern sheen. 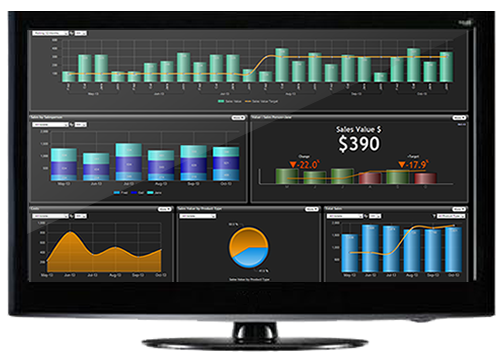 Some managers like having their dashboards on a large screen, so that management staff can always know the company’s current status and progress. 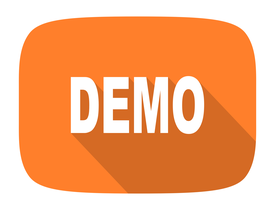 Some dashboard programs allow you to create a slideshow of your dashboards, which will gives staff automatic access to all of your important information. Follow these 8 steps to build effective, meaningful dashboards every time! In the space of three articles, I have shown you 8 easy steps to create effective KPI dashboards for making the best decisions. If you keep these 8 steps in mind, your users will always have easily understandable, custom dashboards with no effort! 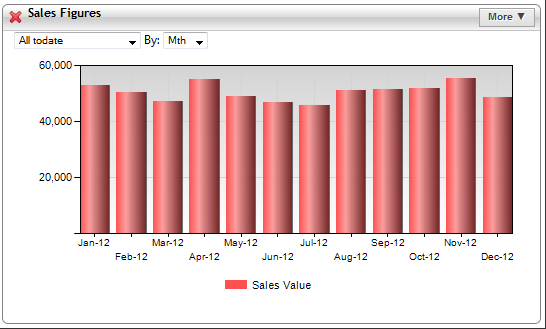 Of course, if you’re ever stuck on how to best present your KPI information, visit our Visual Dashboard Database. This resource lets you search through different visual indicators to find the best chart for your KPIs, and it’s totally free!